Gene expression refers to a complex series of processes in which the information encoded in a gene is used to produce a functional product such as a protein that dictates cell function. It involves several different steps through which DNA is converted to an RNA which in turn is converted into a protein or in some cases an RNA, for example, genes encoding the necessary information for transfer RNAs and ribosomal RNAs (tRNAs and rRNAs). The information flow from DNA to RNA to protein can be controlled at several points helping the cell to adjust the quality and quantity of resulting proteins and thus self-regulate its functions. Thus, regulation of gene expression is a critical step in determining what kind of proteins and how much of each protein is expressed in a cell. This is the first step in gene expression in which DNA molecules are transcribed into their corresponding RNA copy. This process is aided by an enzyme called DNA-dependent RNA polymerase. In this process, the primary RNA obtained after transcription is modified to produce a mature messenger RNA or mRNA. This involves many different ways wherein the pre-mRNA is processed to make it fully functional for the next step in gene expression. Splicing is one such process which involves cleavage of introns (non-coding sequences) and ligation of exons (coding sequences) with the help of several components that recognize specific sequences in the RNA. Addition of a poly A tail to the 3’ end and a cap molecule to the 5’ end are also a crucial part of post-transcriptional processing. 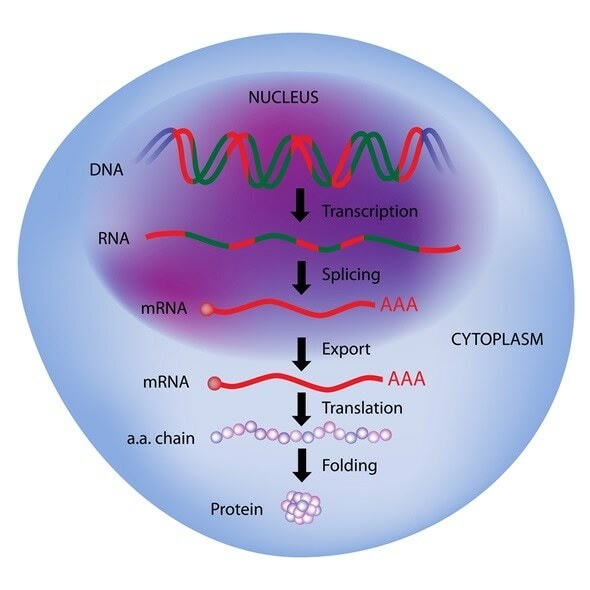 Most of the mature mRNAs produced after modifications are transported from the nucleus to the cytoplasm where the next step in gene expression takes place. This is achieved by moving the mRNAs through tiny pores in the nucleus to reach the cytosol. Upon successful transport of mRNAs to the cytoplasm, the sequence in the mRNA is translated into a protein with the help of several components such as ribosomes, tRNAs or transfer RNAs, and enzymes called aminoacyl tRNA synthetases. Translation of mRNA involves 3 important steps - initiation, elongation, and termination, leading to the formation of polypeptide chains. In this final step, the polypeptide chains or random coils formed during translation fold into a 3D structure giving rise to a functional protein. Failure to fold leads to protein inactivity and misfolded proteins have abnormal functionalities compared to correctly folded ones. In prokaryotic cells, the product of initial transcription is a mature messenger RNA. 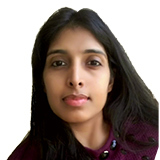 Therefore prokaryotic gene expression does not involve post-transcriptional processing unlike eukaryotes where post-transcriptional processing of pre-mRNA is crucial to the rest of the steps in gene expression. Prokaryotes do not have a defined nucleus that separates the ribosomes from the genetic material. This lack of compartmentalization removes the need for mRNA transport to the cytosol before translation, which is very critical in eukaryotes. Both transcription and translation in prokaryotes occur in the cytoplasm unlike eukaryotic cells where transcription takes place in the nucleus and then the mRNA is transported to the cytoplasm where it undergoes translation. In prokaryotes, a single RNA polymerase is capable of producing multiple types of RNAs, which is not the case with eukaryotes. Although eukaryotic gene expression is more complex compared to prokaryotic gene expression, the complexity provides several opportunities for regulation of gene expression in eukaryotes. Prokaryotic gene expression is controlled primarily during transcription.